When LinkedIn was launched in May 2003, it was mainly perceived as a professional networking site. However, in less than two decades, LinkedIn has attracted 562 million users spread across 200 countries. Today, it is not just a platform that connects job seekers with prospective employers. Rather, it has transformed into an extremely useful marketing tool. It has become important for every business to develop an effective LinkedIn marketing strategy. When executed properly, it can help you build brand awareness and forge long-term professional relationships. It can also be effective for lead generation. Before we discuss how you can build a successful LinkedIn marketing strategy, let’s take a look at why it is so important. The biggest advantage of LinkedIn is that it is frequented by many senior-level influencers, decision-makers, and thought leaders. Marketing on LinkedIn allows you to grab the attention of top-level executives and spread the word about your brand. Unlike other social networking sites such as Facebook and Instagram, LinkedIn offers a goldmine of opportunities for B2B marketers. 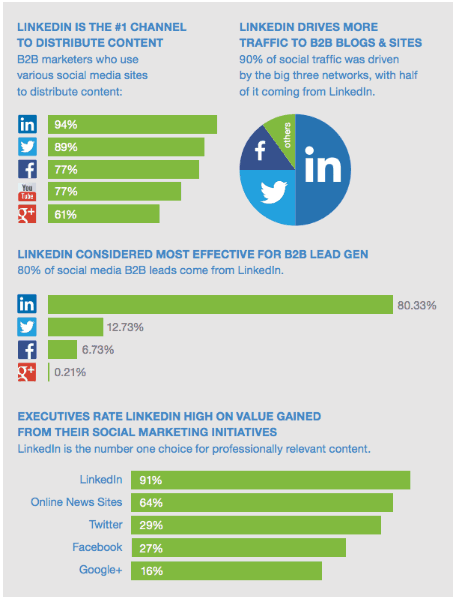 Take a look at the following infographic published by LinkedIn. It is evident that a robust LinkedIn marketing strategy is crucial for the success of your business. It can help you build brand awareness, increase website traffic, generate quality leads, and much more. In addition, it can also help establish yourself as an industry thought leader. However, promoting your brand on LinkedIn requires a set of clearly defined goals and tactics. It also demands a deep understanding of your target audience. Now, let’s now take a look at the steps for creating a successful LinkedIn marketing strategy. The type of content you publish and the approach you use to distribute it on LinkedIn depends on your final objective. That is why it is crucial to outline your goals at the onset of your LinkedIn marketing strategy. Once you have a clear idea of your marketing goals, it is time to define your target audience. You can outline your audience on the basis of different parameters such as job title, geographic location, industry, etc. Let’s say your goal is to sell an ebook on influencer marketing for brands. In this case, your target audience may consist of marketing professionals. They may have job titles such as “social media manager,” “social media executive,” etc. In addition to defining your target audience, it is also important to have a deep understanding of your existing audience. You can use the analytics section on your Company Page to learn more about your followers and page visitors. It can be useful to help you gain meaningful insights about your audience and the type of content they prefer. This, in turn, will help you tailor your LinkedIn marketing strategy to cater to the needs of your audience. Your LinkedIn Company Page is one of the biggest assets of your LinkedIn marketing strategy. It is one of the first interactions your target audience is going to have with your brand. As such, it should help them learn everything they want to know about your business. This includes your information about your products/services, employees, and headquarters etc. Make sure you provide your company logo, website URL, industry, company size, and other details. In addition, you should craft an appropriate description that conveys crucial details about your company and your offerings. You can add a cover image that resonates with your brand. A comprehensive and up-to-date Company Page strengthens your brand’s image by reinforcing your credibility and professionalism. 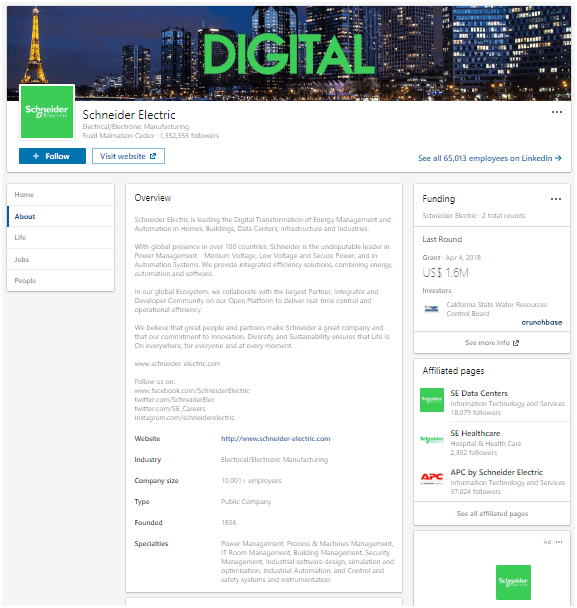 Take a look at the LinkedIn Company Page of Schneider Electric. It is noteworthy that the Overview section functions as a one-stop destination. It provides all necessary information about the company including their website URL, specialties, social media profile links, etc. You should also publish and share relevant content on your Company Page feed to engage your audience. It further reinforces your brand’s credibility and helps establish your brand as an industry thought leader. 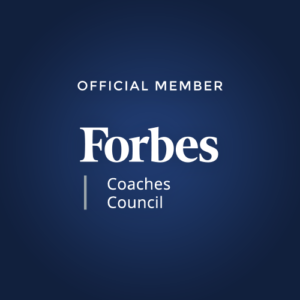 For more examples of effective Company Pages, check out this list of the “Top 10 Company Pages of 2018” picked by LinkedIn. Just like your website, you should also optimize your LinkedIn Company Page for search. In fact, it is an integral part of your LinkedIn marketing strategy. 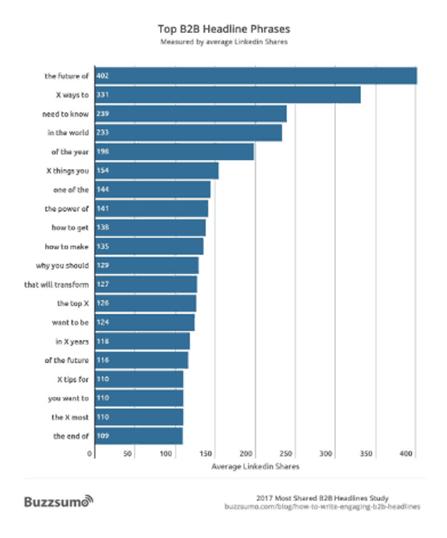 Don’t limit the usage of your targeted keywords to your website and blog. Identify the terms and phrases that your target audience is likely to use when searching for your products or services. Then incorporate them into your company description as well as your list of specialties. 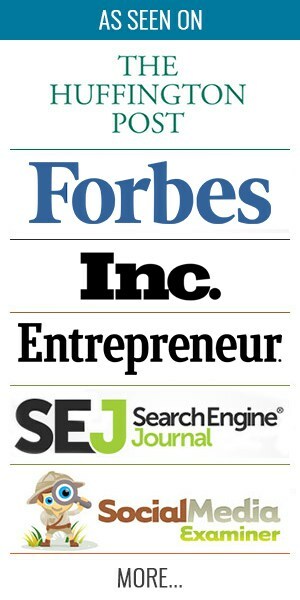 One of the most important factors that dictates the search engine ranking of a page is its inbound link profile. Therefore, to optimize your LinkedIn Company Page for search, you must provide links to it. These could be on your website, blog, newsletters, social media profiles, etc. In addition, you should encourage your employees to complete their personal LinkedIn profiles and add your company as their employer. This creates more links to your Company Page and ultimately, boosts your inbound link profile. In addition to helping you engage with your audience, uploading and sharing relevant content regularly allows it to be indexed by Google. This, in turn, improves your search engine rankings and helps your Company Page climb up on the ladder of search results. LinkedIn provides a feature called “Companies to track” that reveals a list of companies similar to yours. It also gives you access to a few key metrics. These include the total number of followers, follower growth, and social media engagement. Evaluating these pages can help you understand how your own Company Page fares in comparison. You can identify what is working well for them and integrate those tactics into your own LinkedIn marketing strategy. Creating a compelling Company Page is of no use unless you can attract followers and grow your audience. In addition to optimizing your Company Page for search, you should also encourage people to follow it. 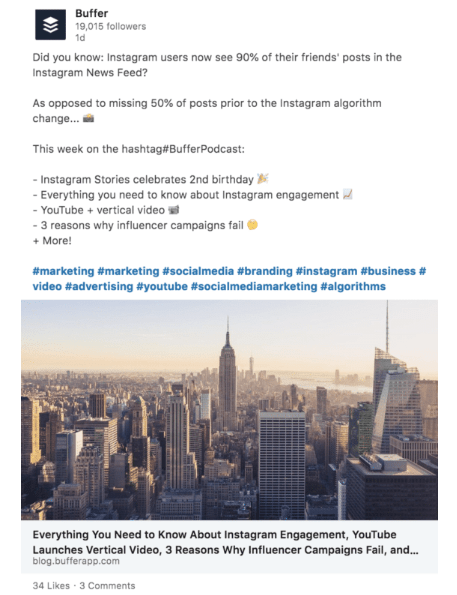 This ensures that your all of your updates show up in their LinkedIn Feed which, in turn, increases the reach of your content. In addition, a high follower count also reinforces the credibility of your company. The easiest way to do this is to ask all your employees and colleagues to become followers of your Company Page. You should also add a “Follow” button in your email signature and newsletters as well as on your blog and website. This allows your subscribers and website visitors to become followers with a single click. Additionally, you can invite your existing customers and collaborators to follow your Company Page. Attracting a significant number of followers to your Company Page is a difficult task. However, achieving a high follower count doesn’t mark the end of your LinkedIn marketing strategy. Retaining your audience and engaging with them is a challenge in its own right. The only way to achieve this is by publishing and sharing meaningful content that will resonate with your audience. The quality of your content can make or break your LinkedIn marketing strategy. Publishing content on LinkedIn requires a thorough understanding of why people spend their time on the platform. You must also understand what they would like to read. In 2017, BuzzSumo conducted a study in which they analyzed 10 million articles shared on LinkedIn. Industry trends – “the future of,” “in the world,” “the power of,” etc. How-to articles – “X ways to,” “X things you,” “X tips for,” etc. These statistics clearly indicate that LinkedIn users are interested in content that educates them. They are also interested in content that helps them stay up-to-date with the latest developments in the industry. Publishing these types of content will help you meet the needs of your audience. LinkedIn is a place frequented by strategic decision-makers and top-level executives. They are less likely to engage with run-of-the-mill content that floats around regularly on social media. An effective way of striking a chord with such an audience is to create fresh and original content. That is why thought leadership content can help you grow your audience and boost engagement on LinkedIn. Industry thought leadership – Your viewpoint on the latest developments in your industry. Organizational thought leadership – A reflection of the vision and ethos of your company. Product thought leadership – Positioning yourself as the best solution for your target customers’ problems. Regardless of the type of content you create, make sure it is not an obvious attempt at self-promotion. In addition to publishing and promoting your own content, you should also share useful and engaging content from other pages. It breathes new life into the feed of your Company Page and helps build relationships with other brands. This, in turn, will help make your LinkedIn marketing strategy even more effective. Make sure you accompany your updates with a descriptive caption, attractive images, appropriate emojis, bullet points, etc. This can help break the monotony of text-based articles. I also recommend that you use relevant hashtags when you post content to increase visibility even further. This is extremely important for the success of your LinkedIn marketing strategy. If you want to maximize audience engagement on your LinkedIn updates, make sure you upload images and videos. This should be done in addition to text-based articles. In fact, according to LinkedIn, images lead to a 2x higher comment rate and LinkedIn videos are 5x more likely to start a conversation. In addition to images and videos, you can also upload SlideShare presentations and PDFs to make your content more attractive. LinkedIn now allows you to upload videos directly onto the platform. It is likely that LinkedIn will prioritize their native videos over links from other platforms. You can make the most of this feature by uploading videos directly to the platform rather than sharing YouTube links. LinkedIn recommends that you create short 1-2 minute videos with proper subtitles. Make sure the videos are authentic and reflect the vision of your brand in an appropriate manner. Consistency is the key to retain your audience and keep them hooked to your LinkedIn Company Page. If you publish engaging content on a regular basis, it helps builds a sense of anticipation among your followers. It results in higher levels of engagement and further increases the reach of your content. This can help you attract more followers and grow your audience on LinkedIn. LinkedIn recommends that you post daily in order to retain your connection with your audience. Because of that, and in order to maintain consistency, I recommended that you create a content calendar as part of your LinkedIn marketing strategy. Establish a timeline for content publishing along with the types of content that you will create. Another important aspect of your LinkedIn marketing strategy is to post your content at times when it will get maximum traction. This means you have to find out the times when your audience is most likely to be online. An easy way of doing this is by taking a look at your click-through rates in the “Updates” section of your Company Page analytics. Experiment with different posting times and analyze the CTR to find out when it peaks. Your employees and colleagues can be immensely helpful in growing your audience and increasing your reach on LinkedIn. Therefore, it is imperative that you make them an essential part of your LinkedIn marketing strategy. In addition to following your Company Page, you can also encourage them to like and share your updates. Make sure you notify them whenever you post an important update on your Company Page. You should also ask them to fill out all of the necessary details on their personal LinkedIn profiles. Make sure they mention your company as their employer and provide a link to your Company Page. This will help your brand gain visibility in their networks. This, in turn, will boost brand awareness and help make your LinkedIn marketing strategy more successful. While you are at this, make sure you also have a complete and updated personal profile on LinkedIn. It may not have a direct impact on your LinkedIn marketing strategy. However, your personal LinkedIn profile showcases the human side of your brand. Creating a promising personal profile can help make your brand image even more powerful. Don’t forget to mention all of your special skills and professional achievements. A crucial aspect of your LinkedIn marketing strategy is to evaluate it on a regular basis. We have already discussed how your Company Page analytics can help you learn useful insights about your audience. It can also help you analyze the performance of your updates. In order to do this, you have to know how the “Updates” section of your Company Page analytics works. You get to see a table that reveals different parameters such as impressions, clicks, engagement, CTR etc. for each of your posts. This information can be used to find out the type of content that is receiving maximum engagement. This will help you refine your LinkedIn marketing strategy and create content that is likely to receive more traction. LinkedIn offers a plethora of opportunities to connect your brand with the right decision-makers and senior-level influencers. It has grown into a powerful marketing tool that can help you build brand awareness and sell your products or services. So it is high time that you recognize its importance and start crafting a powerful LinkedIn marketing strategy. A deep understanding of your end goals and target audience is crucial for the success of your LinkedIn marketing strategy. Make sure you create a compelling Company Page and optimize it for search (on and off LinkedIn). In addition, you should tailor your content strategies and post updates that will appeal specifically to your audience on LinkedIn. Also be sure to use all available resources, including your existing workforce, to increase the reach of your LinkedIn updates and Company Page. What other tactics are you using in your LinkedIn marketing strategy? Share your views in the comments section below.